The world’s first truly global network that allows you to communicate globally with the convenience of a push-to-talk-only handheld is in development from Iridium and Icom. Iridium Communications Inc. (NASDAQ: IRDM) announced today that Icom Incorporated (Icom) has joined its partner ecosystem as a licensed Value-Added Manufacturer (VAM) and will be developing the world’s first push-to-talk-only (PTT) radio handheld that also allows you to communicate globally. Based in Japan, Icom is a world-class manufacturer of two-way handheld radios and will harness their extensive expertise in the making of their first Iridium handheld. This new device will be ideally suited for remote workers, first responders, global military, NGOs, and other organizations in need of real-time communications throughout areas lacking ground infrastructure. Iridium PTT technology allows teams to remain closely coordinated with their headquarters or other field teams around the world, instantly, regardless of geography. The development of this new PTT handheld comes in response to increased market demand for products that are focused on providing a rugged and high-performing solution that supports Iridium’s PTT capability. Icom was chosen in large part due to their recognized expertise in the land-mobile radio (LMR) industry where they provide dozens of products through a growing portfolio. This is the first satellite-based handheld developed by Icom and it is designed to integrate seamlessly with Icom’s current selection of accessories. This will allow for the new satellite handheld to be quickly inventoried and integrated with their existing deployed products. Both Icom’s and Iridium’s distribution networks will offer the new handheld, expanding Icom’s presence to the satellite industry and bringing Iridium’s satellite PTT capabilities to Icom’s existing global sales network. The new handheld is expected to be available in 2019. Iridium is the only communications company that has truly global coverage and is currently in the homestretch of a $3 billion initiative to upgrade its entire low-earth-orbiting satellite constellation with a new generation of interconnected satellites known as Iridium NEXT. To date, 65 new satellites have been placed in orbit with the final launch of 10 satellites planned for December 30, 2018. Upon completion a total of 75 Iridium NEXT satellites will have been delivered to space with 66 in the active constellation and nine serving as on-orbit spares. Iridium is the only mobile voice and data satellite communications network that spans the entire globe. Iridium enables connections between people, organizations, and assets to and from anywhere in real time. Together with its ecosystem of partner companies Iridium delivers an innovative and rich portfolio of reliable solutions for markets that require truly global communications. The company has a major development program underway for its next-generation network, Iridium NEXT. Iridium Communications Inc. is headquartered in McLean, Va., U.S.A., and its common stock trades on the NASDAQ Global Select Market under the ticker symbol IRDM. 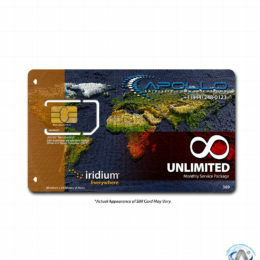 For more information about Iridium products, services, and partner solutions, visit www.iridium.com.